The LA Galaxy, also known as the Los Angeles Galaxy, is an American professional soccer franchise based in the Los Angeles suburb of Carson, California, that competes in Major League Soccer (MLS), as a member of the Western Conference. The club began play in 1996 as one of the league's eight charter members. The Galaxy was founded in 1994 and is owned by Anschutz Entertainment Group. In their early years, the club played its home games at the Rose Bowl in Pasadena, California. Since 2003, they have played at Dignity Health Sports Park in Carson, California. The team holds a rivalry with the San Jose Earthquakes in the California Clásico and used to play the SuperClasico against city rivals Chivas USA before that team folded in 2014. A new rival emerged in 2018 in the form of Los Angeles FC in the El Tráfico derby. The franchise is one of Major League Soccer's most successful teams, with a record five MLS Cups and having appeared an additional four time in the final, and won the Western Conference regular season title eight times, four Supporters' Shields, two U.S. Open Cups and one CONCACAF Champions League title. In 2017, the club added the dubious MLS Wooden Spoon to its trophy case for finishing bottom of the MLS league table. In 2007, the club made international headlines with the signing of English player David Beckham from Real Madrid, the most high-profile transaction with Major League Soccer to that point. 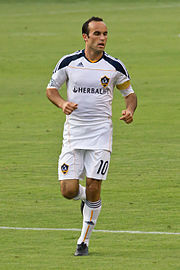 The club has fielded other high-profile international players including Ashley Cole, Robbie Keane, Luis Hernández, Giovani dos Santos, Jonathan dos Santos, Jorge Campos, Steven Gerrard, Zlatan Ibrahimović and American Landon Donovan who is the all-time leading scorer for both the club and the league. In 2017, Forbes estimated the franchise is the most valuable in the league, worth more than $300 million. LA Galaxy is one of the ten founding teams in Major League Soccer. The name "Galaxy" was derived from Los Angeles being home to the "stars" of Hollywood. The team began competing in the first season of the then new league, which took place in 1996. In the inaugural season, Los Angeles finished first in the Western Conference and were one of the two teams that contested in the first MLS Cup. The Galaxy finished as runners up, losing to D.C. United in the final. The 1997 season started out 1–7 after eight games, but they went 15–9 for the rest of the season to qualify for the playoffs. The Galaxy ended up second in their conference by losing to the Dallas Burn. In 1998, the Galaxy left off on a streak, eventually finishing 24–8. The Galaxy defeated the Dallas Burn, 9–3 on aggregate. They lost in the semi-final to the Chicago Fire, 2–1 on aggregate. The Galaxy again finished first in the Western Conference in 1999, with a final record of 20–12, with a win in the CONCACAF Champions Cup, but they lost to D.C. United again 2–0. The 2000 season had the Galaxy in second in the Western Division, at 14–10–8. Despite this, they lost to the Kansas City Wizards after a tied aggregate and a sudden death game. Los Angeles won the CONCACAF Champions Cup that same year, being one of two American clubs winning the tournament. 2001 was another successful year for Los Angeles, winning the Open Cup and scoring 1,000 all-time points, and with Cobi Jones scoring the 300th goal, but again they fell short by being defeated by Landon Donovan and the San Jose Earthquakes. Again the club clinched first in the Western Conference with a 16–9–3 record, their fifth time being first. Los Angeles were to take part of FIFA's club World cup tournament being Concacaf champions the previous year however, the tournament had cancelled that year. In 2002, the Galaxy won their first MLS Cup in the club's fourth appearance by defeating the New England Revolution 1–0. In 2003, the Galaxy finished fourth playing more away games due to stadium construction, with the possible existing obstacles, the team finished 9–12–9. The Galaxy bounced back by gaining second with an 11–9–10 record. They lost to the Wizards in the final, 0–2. In 2005, the Galaxy acquired Landon Donovan from San Jose. The franchise won the Open Cup again ending with a record of 13–13–6. Having qualified for the playoffs for the 2005 season, The Galaxy has been the only team to appear in the playoffs in all of the league's first ten seasons. They won the 2005 MLS Cup, defeating the New England Revolution in extra time, 1–0. The 2006 season began on March 16 with the sudden death of Doug Hamilton, the team's 43-year-old general manager, who suffered a heart attack on board a plane carrying the team back from Costa Rica where they had played Saprissa in the CONCACAF Champions' Cup. The team finished fifth in the Western Conference, eliminating them from playoff contention for the first time since the league's inception. Midway through the season, Steve Sampson was sacked as Head Coach, replaced by Frank Yallop. The team managed to make a deep run to the U.S. Open Cup final, but lost 3–1 against the Chicago Fire. In March 2007, Herbalife signed a five-year deal with the Galaxy, worth between $4–5 million a year, to be the club's primary shirt sponsor. Four months later, the club signed David Beckham from Real Madrid. His debut was made at Home Depot Center before a record crowd of nearly 35,000, including many celebrities, coming on in the 78th minute in a 1–0 loss to Chelsea in a match during the World Series of Football tournament. The match brought unprecedented TV coverage from ESPN, who used 19 cameras to cover it, including one trained only on Beckham, even when he was on the bench. In that season's SuperLiga, LA reached the final but lost to Mexican side Pachuca on penalties after extra time. LA nearly made the end-of-season play-offs, but were eliminated following a 1–0 loss to the Chicago Fire. In the off-season, Cobi Jones retired and, amidst rumors that he was going to be sacked, Yallop resigned as head coach following a friendly match at Home Depot Center. The San Jose Earthquakes bought out his contract and offered a third round draft pick to the Galaxy as compensation to hire Yallop as their new head coach. Yallop was replaced at LA by Ruud Gullit, who signed a three-year contract with the club, making him the highest paid coach in MLS history. Cobi Jones returned as assistant coach. LA went on a promotional tour of Australia and New Zealand, setting attendance records in both countries. 80,295 people showed up at Stadium Australia for the match between Sydney FC and LA Galaxy, which the home side won 5–3. They also played a tour of Asia, and competed in the inaugural Pan-Pacific Championship in Honolulu, finishing third after beating Sydney 2–1 in the third-place match. In the 2008 MLS season, LA went on a seven-game winless streak that saw them drop from first place in the Western Conference to outside playoff contention, prompting the resignation of manager Ruud Gullit and firing of general manager Alexi Lalas. Gullit was replaced by Bruce Arena, who was unable to lead LA into a play-off spot, for the third-straight season. In the following off-season, both club captain David Beckham and vice-captain Landon Donovan were involved in loan deals with European clubs until the beginning of the new MLS season; Beckham to Milan in Italy and Donovan to German club Bayern Munich. Donovan was seeking a permanent transfer to Munich, while Beckham was expected to return to LA in March, prior to the 2009 season. Beckham went on to seek a permanent transfer to Milan in a bid to sustain his England career through the 2010 World Cup, and Milan made a bid for the player that was rejected by LA. One day before his loan deal was to expire, Milan and LA reached an agreement to allow Beckham to stay in Italy until the conclusion of the Rossoneri's season in June, before returning to LA in July. Donovan was not offered a contract by Bayern, and returned to the U.S. in time for the beginning of the 2009 MLS season. In the book The Beckham Experiment by Grant Wahl, Donovan openly criticized Beckham for his handling of the loan deals. Beckham and Donovan would later reconcile upon Beckham's return to LA in July. LA finished the 2009 season top of the Western Conference and runners-up in the MLS Supporters' Shield, qualifying for the 2009 MLS Cup. They reached the final by beating Chivas USA 3–2 on aggregate in the quarter-final, and Houston Dynamo 2–0, after extra time, in the semi-final. In the final they drew 1–1 with Real Salt Lake at Qwest Field in Seattle, but lost 5–4 on penalties. By reaching the final, they qualified for the 2010–11 CONCACAF Champions League Preliminary Round. After the 2009 success, both Donovan and Beckham again went out on second loan spells. Donovan went to Everton while Beckham returned to Milan, where he ruptured his Achilles tendon and therefore missed his chance at playing in the World Cup for England and subsequently missing most of the Galaxy's 2010 season. In 2010, the Galaxy stayed at the top of the table and won the Supporters' Shield, the first time MLS played a balanced schedule. They then lost to FC Dallas in the Western Conference Final, one game away from making another appearance at MLS Cup. In 2011, a year in which they added the Republic of Ireland's all-time leading goalscorer Robbie Keane, they won their fourth Supporters' Shield with two games remaining, becoming the third-straight team to win consecutive Shields while amassing the second-best points total in MLS history. They followed this up with their third MLS Cup, defeating the Houston Dynamo 1–0 in the final. The 2011 MLS Cup was the Galaxy's first MLS Cup Victory in regulation. The 2002 and the 2005 MLS Cup wins were won in overtime. In January 2012, after much speculation, Beckham signed a new two-year deal with LA to secure his short-term future at the club. Despite the new contract, Beckham confirmed in November 2012 that he would be leaving the Galaxy at the end of the 2012 MLS season. On December 1, 2012, the Galaxy won their second-straight MLS Cup victory over the Houston Dynamo, 3–1. Galaxy defender Omar Gonzalez won the MLS MVP trophy, heading in the 1–1 equalizer in the 60th minute. That goal was quickly followed by a Donovan penalty kick, and Keane sealed the game with another penalty kick in stoppage time. In post-match interviews both Donovan and Beckham remained coy about their future MLS plans. Galaxy finished the 2013 season third in the Western Conference. They reached the conference semi-finals, where they lost 2–1 to Real Salt Lake. They also reached the semi-finals of the 2012–13 CONCACAF Champions League, but lost 3–1 on aggregate to Mexican team Monterrey. Following the defeat to Seattle Sounders FC in the final game of the season with the Supporters' Shield on the line, the team entered the 2014 MLS playoffs defeating Real Salt Lake, advancing to face Seattle once again in the Western Conference Finals, advancing to the MLS Cup by away goals. They played the New England Revolution in the 2014 MLS Cup and won 2–1 in overtime, thereby becoming five-time champions, a league record. At the end of the season, longtime LA Galaxy and United States national team player Landon Donovan retired. On January 7, 2015, the LA Galaxy announced the signing of long time Liverpool player Steven Gerrard to an 18-month Designated Player contract, reportedly worth $9 million. He joined the team in July 2015 following the end of the 2014–15 Premier League season, and made his debut in an International Champions Cup against Club América on July 11. The club again made headlines by acquiring Mexican star and Barcelona academy product Giovani dos Santos in July as a designated player. Not since the days of Jorge Campos, Carlos Hermosillo and Luis Hernández in the late 1990s and early 2000s had the Galaxy had a notable Mexican player, let alone one in the prime of his career. Dos Santos made an impactful impression on the Galaxy early on, scoring on his club debut against Central FC in the CONCACAF Champions League and then in his league debut against the Sounders. In his first five club matches, he had a goal, an assist or both to total with four goals and five assists in that span. Before the start of the 2016 season, it was announced that long-time servicing center-back Omar Gonzalez would leave the Galaxy after nine years to C.F. Pachuca. On November 22, 2016, long-time general manager and head coach, Bruce Arena, left the club to begin his second stint as head coach of the United States national team, bringing most of the Galaxy's coaching staff with him, including associate head coach, Dave Sarachan. Arena was replaced as general manager by former Galaxy player Peter Vagenas, and as head coach by his LA Galaxy II counterpart, Curt Onalfo. The front office constructed the team to rely on players from the Academy and Galaxy II system. Multiple injuries exposed the naive roster construction, which included erratic performances by Jermain Jones, and sparse production from Giovanni Dos Santos. With a 6–10–4 record, the Galaxy fired Kurt Onalfo and replaced him with former head coach Sigi Schmid on July 27, 2017. Under Schmid, the club went 2–8–4 and finished the season in last place overall with a mark of 8–18–8. It was only the fourth time that the club failed to make the postseason, and the club's first wooden spoon. In March 2018, the team signed Zlatan Ibrahimović on a two-year, $3 million contract with targeted allocation money. With the signing of Ibrahimović, the Galaxy's season would be seen promising. The Swede made his debut in the inaugural El Tráfico match against LAFC, scoring two goals to end the game with the Galaxy coming from 0–3 down to win 4–3. One of the goals Ibrahimović scored in that game later claimed MLS Goal of the Year. Los Angeles throughout the season had dealt with defensive struggles and on their last match of the regular season, against Houston Dynamo, the Galaxy were defeated and once again missed the postseason. After the 2018 season, the Galaxy ended Ibrahimović's original deal and signed him to a new and higher salaried designated player contract. On March 1, 2019, the team announced they had exercised its one offseason Buyout of a Guaranteed Contract on Giovani dos Santos, thus releasing him from the team. Wikimedia Commons has media related to Los Angeles Galaxy kits. The LA Galaxy's current colors are white, navy blue and gold. The team's primary uniform is white and the secondary uniform is blue. The colors were adopted to coincide with David Beckham's arrival with the team in 2007 as part of an overall re-branding exercise spearheaded by then GM Alexi Lalas. Prior to 2007, the Galaxy played in various color combinations, usually comprising gold, teal green and white with black accents, and often highlighting an iconic 'sash' design from the left shoulder and across the chest. Their original jersey, used in the inaugural 1996 MLS season, reflected the colors of the city of Los Angeles and featured black-and-teal halves, black sleeves with gold and red accents, black shorts and black socks. The Galaxy have had two logos to date. The original brand was gold, teal and black, and featured the Galaxy wordmark superimposed over a golden swirl, with a stylized black outline. The logo was changed in 2007, again to coincide with David Beckham's arrival, and now features a blue shield with a gold border, the LA Galaxy team name, and a quasar at the top of the crest. The quasar featured prominently on the LA Galaxy's shield was originally featured on the 1957 Seal of Los Angeles County as well as the modified Seal of Los Angeles County, California which is featured on the Flag of Los Angeles. The name "Galaxy" was created by Nike at the conception of the league, the company was also the original uniform supplier for the team. The Galaxy first turned a profit in 2003, becoming the first MLS team to do so. After the team moved into the new Home Depot Center, the team saw increased attendance, a doubling of revenue from sponsors, and revenues from parking and concessions. A Forbes 2015 report ranked the LA Galaxy second in MLS in terms of annual revenue ($44 million) and in franchise value ($240 million). The Galaxy earn more in annual club sponsorship income ($14 million) and annual local TV rights ($5 million) than any other MLS team. The Galaxy have the highest annual revenue of any MLS team, the third highest revenue of any CONCACAF team, and the seventh highest revenue of any team in the Americas. From 1996 to 2002, the Galaxy played their home games at the 107,000-capacity Rose Bowl in Pasadena, but often held U.S. Open Cup games at Titan Stadium on the campus of Cal State Fullerton. The Galaxy played 10 games in total at Titan Stadium; the U.S. Open Cup Final was held there in 2001 when the Galaxy won the tournament. In 2003, the Galaxy moved to Dignity Health Sports Park (then known as the Home Depot Center, later known as StubHub Center), on the campus of California State University, Dominguez Hills in Carson, approximately ten miles south of downtown Los Angeles. The stadium is a 27,000-seat soccer-specific stadium, the second of its kind in MLS, but has hosted other sports such as rugby and American football. From 2005 to 2014, the Galaxy shared the stadium with their now-defunct league rivals Chivas USA, with whom they competed for the SuperClasico. 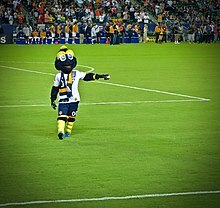 Cozmo is the Galaxy's mascot. He has dark blue skin with yellow eyebrows and white eyes matching the Galaxy's home uniform colors. He replaced the Galaxy's original mascot, "Twizzle", who also looked like it was from outer space but was more humanoid in form, wearing a space-man's helmet and cape. The Galaxy Star Squad is the official cheerleaders of the club. They often attend events hosted by the Galaxy, such as autograph sessions, and can be often seen around the stadium during game time giving away scarves and supporting the team. The Angel City Brigade was created to help establish a festive and vibrant atmosphere in Dignity Health Sports Park for the Galaxy. They sit in section 121 in the General Admission area of the stadium. The LA Riot Squad formed after a loss in the 2001 MLS Cup, when then-Galaxy keeper Kevin Hartman challenged a group of Galaxy fans to form a supporter group of 100 people by opening day of 2002. The reward if they were able to do this was a keg of beer. They are located in sections 137 and 138 in the General Admission area of the stadium. The Galaxy's chief rivalry match is played against the San Jose Earthquakes, which is known by the fans and media as the California Clásico. It is considered among the fiercest and longest-running rivalries in American soccer. The intrastate rivalry dates to the founding of MLS, and their encounters in the MLS Cup playoffs and final. Some also cite that the rivalry developed in reflection of traditional Northern California vs Southern California sports rivalries. When Los Angeles FC joined the league in 2018, a crosstown rivalry, El Tráfico, was born. The former LA Derby was previously contested between the Galaxy and Chivas USA in the SuperClasico. This contest, with Chivas USA, was dominated by the Galaxy, who won 22 of the 34 encounters. The rivalry was the only intra-stadium rivalry in MLS until Chivas ceased operations at the end of the 2014 season. At the end of the 2011 season, the Galaxy announced a ten-year, $55 million deal with Time Warner Cable (Now Charter Spectrum), the most lucrative local media contract in MLS history, to begin at the end of the 2012 MLS season. Previously, Galaxy matches were televised regionally in English on Fox Sports West and Prime Ticket alternatively. While awaiting the launch of those networks, all 2012 English-language matches were split between local outlet KDOC with one match showcased on Time Warner Cable SportsNet near the end of the season. Commentary is handled by Joe Tutino and former Galaxy player Cobi Jones. In Spanish, 2012 matches were shown on independent outlet KWHY with Adrian Garcia Marquez and Francisco Pinto commentating. All nationally televised MLS games are aired on Fox Sports 1 and ESPN. Radio coverage of regular season matches are broadcast in English on lagalaxy.com and in Spanish on ESPN Deportes KWKW 1330 AM (Los Angeles). Joe Tutino does the English play-by-play when Spectrum Sports does not televise. Alternatively, long-time Los Angeles broadcaster Fred Roggin does the play-by-play. Ralph Perez is the analyst. On Spanish-language broadcasts, Rolando "El Veloz" Gonzalez handles the play-by-play and Armando Aguayo does the commentary. For details on former players, see All-time Los Angeles Galaxy roster. The Galaxy created the LA Galaxy II reserve team in January 2014 to compete in the USL. In their inaugural season, Los Dos finished third with a record of 15–6–7, and reached the semi-final where they lost to Sacramento Republic FC. For the 2015 USL season, the Galaxy were placed in the Western Conference. As part of its development program, the Galaxy operates an academy system with U-18 and U-16 teams competing in the U.S. Soccer Development Academy, and U-14 and U-12 teams competing in Southern California Developmental Soccer Leagues (SCDSL). Recent academy graduates include: Jack McBean, Oscar Sorto, Jose Villarreal, Gyasi Zardes, Raul Mendiola and Bradford Jamieson IV. 7 year old Malea Emma Tjandrawidjaja won Social Galaxy contest to sing the National Anthem at the LA Galaxy Game on September 23, 2018. Her incredible performance went viral with over 25 million views across all social media platforms. The LA Galaxy have not officially retired any jersey number. 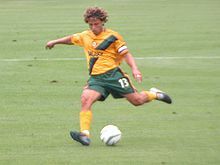 Former LA Galaxy player, Cobi Jones, was incorrectly believed to have had his jersey number, 13, retired. Adam Serrano, "LA Galaxy Insider", clarified this in an article posted on February 7, 2017: "The number was not officially retired by the Galaxy but has not been worn since he (Cobi Jones) hung up his boots 10 years ago." The Golden boot winner is the leading goal scorer at the end of the season (only goals in MLS count). This award did not exist from 1996 to 2004. The MLS Scoring Champion Award included both goal and assist totals those years. ^ "General Overview". Major League Soccer. 2009. Archived from the original on June 25, 2008. Retrieved June 26, 2009. ^ "Main Stadium – Dignity Health Sports Park". Retrieved January 1, 2019. ^ "No. 135 (and 136) at last: Landon Donovan becomes MLS all-time goal king – Planet Futbol – SI.com". Sports Illustrated. May 25, 2014. Archived from the original on May 29, 2014. Retrieved June 5, 2014. ^ Smith, Chris (August 16, 2017). "Major League Soccer's Most Valuable Teams 2017". Forbes. Retrieved December 9, 2018. ^ "Los Angeles Galaxy (1996–present)". Sports E-cyclopedia. Retrieved April 6, 2007. ^ "Wire: Galaxy Claims 2002 MLS Cup with 1–0 Double OT Win Over Revs, Will Go for Rare "Double" vs. Crew in U.S. Open Cup Final on Thursday". U.S. Soccer. Archived from the original on April 25, 2012. Retrieved October 30, 2011. ^ "Lagalaxy.com". LA Galaxy. Retrieved September 20, 2014. ^ "HIGHLIGHTS: LA Galaxy vs. NE Revolution | MLS Cup 2005". November 13, 2005. ^ "Galaxy GM, president Doug Hamilton dies on flight home". soccertimes.com. March 9, 2006. Archived from the original on September 8, 2008. Retrieved May 11, 2008. ^ a b "Galaxy fires Sampson as coach". USA Today (AP). June 6, 2006. Retrieved May 11, 2008. ^ "L.A. 'Galaxy' Gets Herbalife Lift". Media Buyer Planner. January 10, 2008. Retrieved January 10, 2008. ^ a b "Celebrities at the LA Galaxy vs. Chelsea F.C." Zimbio. January 21, 2007. Retrieved July 21, 2007. ^ "Beckham debut a surreal night for MLS". ESPN FC. 2007. Retrieved July 22, 2007. ^ "Yallop leaves Los Angeles to coach Quakes". mlsnet.com. 2007. Archived from the original on January 6, 2008. Retrieved February 5, 2008. ^ "Los Angeles Galaxy appoint Gullit as coach". ESPN FC. 2007. Retrieved February 5, 2008. ^ McMorran, Steve (December 2, 2007). "Beckham superb in L.A. Galaxy's tour final". USA Today. Retrieved December 2, 2007. ^ "Galaxy can't top Gamba Osaka at PPC". la.galaxy.mlsnet.com. 2008. Archived from the original on February 25, 2008. Retrieved February 5, 2008. ^ "Beckham, Los Angeles beat Sydney in third-place match". ESPN FC. 2008. Retrieved February 5, 2008. ^ "Report: Los Angeles coach Gullit resigns; president/GM Lalas out". ESPN FC. Retrieved August 11, 2008. ^ "2008 MLS Cup Playoffs Schedule Announced". Our Sports Central. 2008. Retrieved September 27, 2008. ^ "Los Angeles reject A.C. Milan's opening gambit for Becks". ESPN FC. 2009. Retrieved February 7, 2009. ^ "Beckham admits he wants to swap LA for Milan". ESPN FC. February 4, 2009. Retrieved August 23, 2010. ^ a b "Beckham Agrees to Return to Los Angeles in Mid-july". Los Angeles Times. 2009. Retrieved March 8, 2009. ^ Fifield, Dominic (July 16, 2009). "David Beckham warns LA Galaxy he will go on loan again". The Guardian. London. ^ Wahl, Grant (November 28, 2011). "Hollywood Ending: If this was indeed David Beckham's final game in MLS, he went out in style, carrying the Galaxy to a championship and affirming the value of star power in America". Sports Illustrated. Archived from the original on December 13, 2013. Retrieved November 25, 2011. ^ Markazi, Arash (January 19, 2012). "David Beckham to stay with Galaxy". ESPN. Archived from the original on January 23, 2012. Retrieved December 3, 2011. ^ Wahl, Grant (November 20, 2012). "Beckham to leave Galaxy". FIFA. Retrieved December 3, 2012. ^ "Recap: Gonzalez, Donovan lift Galaxy to fourth MLS Cup". MLS Network. December 1, 2012. Archived from the original on December 5, 2012. Retrieved December 3, 2011. ^ Daviz\s, Steve (December 1, 2012). "Yet Another Retirement Hint from Landon Donovan". NBC Sports. Retrieved December 3, 2011. ^ Daviz\s, Steve (December 2, 2012). "Beckham coy after MLS farewell". NBC Sports. Retrieved December 3, 2011. ^ Dawkes, Phil (December 7, 2014). "LA Galaxy 2–1 New England Revolution". BBC Sport. Retrieved January 12, 2015. ^ "Landon Donovan: Forward retires as champion after MLS win". BBC Sport. December 9, 2014. Retrieved January 12, 2015. ^ Baxter, Kevin (January 7, 2015). "Galaxy announces Steven Gerrard's 18-month deal on Wednesday". Los Angeles Times. Retrieved January 7, 2015. ^ "Gerrard makes quiet debut for Los Angeles Galaxy". Yahoo. July 12, 2015. Archived from the original on December 23, 2015. Retrieved July 12, 2015. ^ "LA Galaxy transfer defender Omar Gonzalez to C.F. Pachuca". MLSsoccer.com. December 22, 2015. Retrieved December 22, 2015. ^ "LA Galaxy name Sigi Schmid Head Coach; Curt Onalfo relieved of duties effective immediately". LAGalaxy.com. July 27, 2017. Retrieved July 27, 2017. ^ "Could Zlatan Ibrahimović make his debut on March 31 against LAFC?". March 23, 2018. ^ Boehm, Charles. "LA Galaxy 2, Houston Dynamo 3 | 2018 MLS Match Recap". mlssoccer.com. ^ "Zlatan Ibrahimovic signs Designated Player deal with LA Galaxy". ESPN. December 18, 2018. Retrieved February 6, 2019. ^ Rodriguez, Alicia (March 1, 2019). "LA Galaxy buy out Giovani dos Santos to remove him from roster". mlssoccer.com. ^ "LA Galaxy FAQ: What are the Galaxy's colors?". lagalaxy.com. February 23, 2012. ^ "Oldfootballshirts.com". Oldfootballshirts.com. Retrieved October 30, 2011. ^ "Justsoccerjerseys.com". Justsoccerjerseys.com. March 13, 2009. Archived from the original on July 13, 2011. Retrieved October 30, 2011. ^ "MLS and the LA Galaxy: A History". January 5, 2012. ^ a b Published. "Leiweke Says Galaxy Are First MLS Team Ever To Make A Profit". SportsBusiness Daily. Retrieved April 22, 2014. ^ "Major League Soccer's Most Valuable Teams". Forbes. August 19, 2015. Retrieved August 22, 2015. ^ Wahl, Grant (March 14, 2014). "2014 MLS Ambition Rankings: Toronto FC rises to No. 1 | Planet Futbol". Sports Illustrated. Archived from the original on March 21, 2014. Retrieved April 22, 2014. ^ Published. "Liga MX Chivas Leads North, South American Clubs In '13 Revenue With $625M – SportsBusiness Daily | SportsBusiness Daily Global". SportsBusiness Daily. Retrieved April 22, 2014. ^ Becker, Josie (January 5, 2012). "LA Galaxy Kit History - Home Kits". LAG Confidential. ^ "Homedepotcenter.com". Homedepotcenter.com. Archived from the original on October 8, 2011. Retrieved October 30, 2011. ^ "Cozmo". LA Galaxy. February 25, 2013. Retrieved September 20, 2014. ^ "Servinghistory.com". Servinghistory.com. Retrieved October 30, 2011. ^ "Galaxy Star Squad". LA Galaxy. February 23, 2012. Retrieved September 20, 2014. ^ a b "Supporters Clubs". LA Galaxy. February 23, 2012. Retrieved September 20, 2014. ^ "Ring of Honor | LA Galaxy". ^ Laurie Andress (August 16, 2011). "LA Galaxy Host Rival San Jose Earthquakes Once More". LAG Confidential. Retrieved May 17, 2012. ^ Robert Jonas (June 24, 2011). "The "New" California Clasico: Earthquakes and Galaxy work to rekindle their rivalry". Quake Rattle and Goal!. Retrieved May 18, 2012. ^ Chris (June 24, 2011). "It's that time of year again; California Clasico!". The Offside. Archived from the original on November 5, 2013. Retrieved May 18, 2012. ^ Jeff Carlisle (April 2, 2008). "Galaxy and Quakes resume their rivalry". Retrieved April 4, 2008. ^ "Wiebe: First-ever "El Trafico" will lay stakes for LA Galaxy-LAFC rivalry". MLSsoccer.com. March 30, 2018. ^ "Galaxy rout Chivas in LA derby". FIFA. October 7, 2013. ^ "LA Derby: LA Galaxy Must Earn Win Against Chivas USA". Stoppage Time Soccer. April 4, 2014. 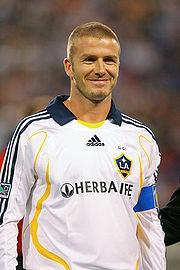 ^ "Beckham goal leads Galaxy past Chivas USA in L.A. derby". The Sports Network. ^ Jake Little. "LA Galaxy vs. Chivas USA: Galaxy Score Then Concede Late in a Thrilling LA Derby". Bleacher Report. ^ "Galaxy thrash Chivas in LA derby clash". News. ^ "LA Galaxy and Time Warner Cable Sports reach 10-year agreement to televise Galaxy games". November 18, 2011. Retrieved November 22, 2011. ^ "Foxsportwest.com". Foxsportswest.com. Archived from the original on May 25, 2017. Retrieved October 30, 2011. ^ LA Galaxy Communications (March 8, 2012). "Source". Lagalaxy.com. Retrieved March 9, 2012. ^ "LA Galaxy announce 2015 radio broadcast schedule". LA Galaxy Communications. March 3, 2015. Retrieved August 15, 2015. ^ "Players". Retrieved September 27, 2017. ^ "lagalaxy.com". LA Galaxy. February 23, 2012. Retrieved September 20, 2014. ^ Twellman, Taylor (September 10, 2018). "Effective immediately Sigi Schmid is stepping down from @LAGalaxy as head coach with Dominic Kinnear taking over as interim. #MLS". ^ "LA Galaxy Place Team in USL PRO". USL Pro. Archived from the original on February 3, 2014. Retrieved January 29, 2014. ^ "LA Galaxy Academy". February 23, 2012. ^ "Alumni List". February 23, 2012. Retrieved February 5, 2014. ^ "LA Galaxy Academy". January 9, 2013. ^ "LAGOC ANNOUNCE UPSL MEN'S TEAM". lagalaxyoc.com. ^ "USA – LA Galaxy – Results, fixtures, squad, statistics, photos, videos and news". Soccerway. Retrieved March 24, 2018. ^ "MLS Announces 2018 Club and Executive Award Winners | MLSsoccer.com". ^ "Adam Serrano". February 7, 2017. Retrieved November 25, 2017. ^ "mlssoccer.com". Retrieved September 20, 2014. ^ "By Season". MLS. Retrieved September 27, 2017. ^ "All Competitions – Player Registry". LA Galaxy. April 2, 2015. Retrieved March 25, 2018. ^ "Major League Soccer Season Statistics". Wikimedia Commons has media related to Los Angeles Galaxy.